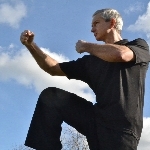 Yang style T’ai Chi is characterised by it’s slow, soft and steady movements. It is a very good form for beginners to start with because of this; as well as being elegant and calming. However, it’s continuous slow movements are ideal for practitioners of any experience to perform ‘moving meditation’. We also practise the two person form to aid with the martial arts applications of the solo form. Chen style is the oldest form of T’ai Chi and is characterised by alternating slow, soft movements with fast, explosive movements. It is more demanding than Yang style with spiralling, twisting and powerful techniques, making this a form for the more experienced practitioner. The Chen forms encourages small, quick movements of the hip to generate power usually gained from larger movements. Push hands is a set of two person exercises that is not only an application of the principals of the solo form, but is a whole practice in it’s own right. Push hands also teaches the practitioner to read the movements of an opponent through ‘listening’, to yield and lead an attack by ‘sticking’. As well as push hands forms we also practice free-form push hands, in effect push hands sparring.